Multi-instrumentalist (fiddle, bass, guitar, and mandolin) Don Raby works around Austin and Central Texas and he tours with Dale Watson and His Lonestars. He is pictured left with Allan Tomkins in Sydney, 2007. 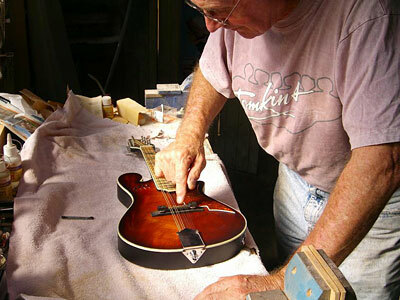 Pictured below, Allan puts the finishing touches to Don's mandolin. 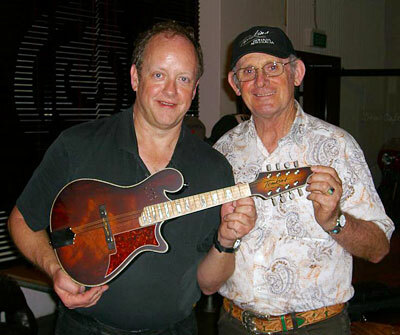 Don writes..."I have been playing the Tomkins mandolin every day...the action is perfect - the finish is perfect - the tone is perfect - it is in perfect tune all the time. All in all, I would say... it is perfect!"